Dear readers, yesterday a miracle happened: the stars aligned, the box office was bored, or someone at the Penn Cinema has a serious love of period drama. Jane Eyre was playing. Playing more than once. Like, for serious. And when I found out the theatre was only 30 minutes away (which is WAY closer than one would imagine), I roped my mother into taking me to the matinee. (Click here to see if its playing in your town.) There were only 11 people in the theatre, of whom I was the youngest, and half were forced into seeing the movies with their girlfriends or wives. Now that I've set the scene, lets discuss the movie. I'll warn you now, if you thought this would be a glowing review, put your big girl corest on, you might not like me much at the end. That being said, somethings were done REALLY well, but if I was only 4 years younger, this adaptation would be called the bane of my existence. Bronte purists stay away. There. I've warned you. 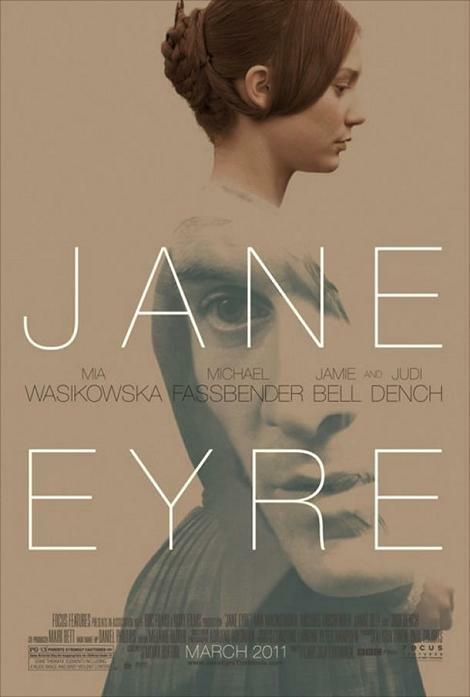 First off, I want to give credit where credit it completely due: if you haven't read this Jane Eyre Review by Jean and Vic, posted at Jane Austen Today, you must. It describes the foundational plot issues in the new Jane Eyre, which I agree with fully. Even I, who has seen -- and you know I'm not joking -- practically every adaptation, was confused by the first seconds of the movie. Had I not be warned by the above article, I wouldn't have been able to coach my mother through the first 15 minutes with the proper back story. And she's seen a few Jane Eyres too. 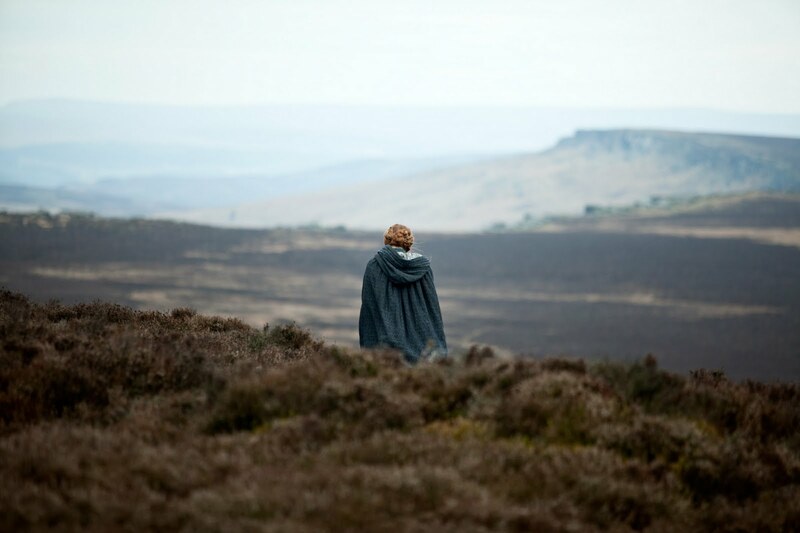 The short version - post Rochester meltdown, wandering on the Moors. Likewise, the use of flashbacks as a central plot device changes the tone of the story in very interesting ways. Condensing events and scenes chomps at the plot and dizzies the viewer. This adaption plays more like a highlight reel for Jane Eyre fans, more than a cohesive, understandable story that can stand on its own. For instance, Adele and her mother's story is never told; Rochester's bed one night, just shows up lit on fire; There is no gypsy scene period and the proposal has no strong build up and falls pathetically flat. Bertha -- wait for it -- is characterized as a ghost-vampire that haunts the halls at night, but the suspense and fear she could invoke is never capitalized on. Clearly Fukunaga could not commit to making either a romance or a suspense, and both story lines suffer for it. I would have been happy to see either road taken; however, this washy, middle of the road muddiness plays out as a symptom of the whole film's mediocrity. His characters suffer from a strange flatness I didn't expect and the stark locations only seem to heighten how flat everything is. I wasn't sure what to commit to, wasn't sure who to be afraid of: the intensity to stand behind a character simply wasn't there. Its not that this Jane Eyre is awful. Its not. But neither is it brilliant, neither is it passionate, neither is it intense. Instead of getting the sense that Fukunaga strove for something and it just didn't work, like that hideous Ciran Hinds version, this film just ambles along. Its content to be just another adaptation in a long line of adaptations. 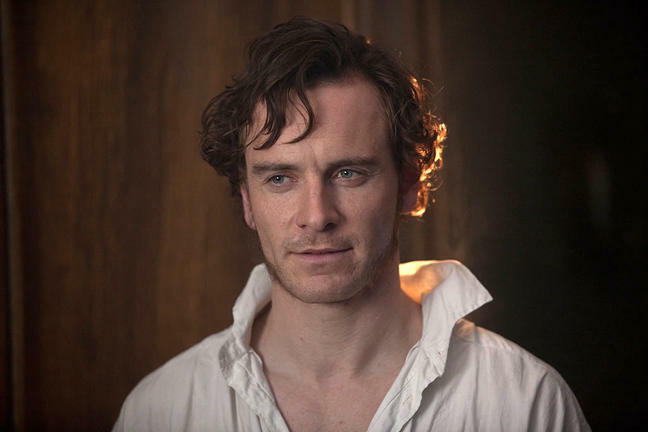 Michael Fassbender's Rochester is not excluded from the above critique. I shall try to be diplomatic, I know I need to see the film again, and I know I WAS HIS BIGGEST SUPPORTER FOR THIS ROLE. I know. Trust me, I know. Fassbender plays Rochester with a tortured subtly. His performance does not reflect Rochester's changeability, depressions, or fierce longing for Jane. Overall, he reminds me of Michael Jayston Rochester. (And you all know I like my Rochesters broody, but I respect the interpretation of the character.) Personally, I was expecting a touch of his character from HEX to show up: the cockiness, the latent danger, the recklessness. Not getting that was a let down; chalk this one up to completely personal preference, but I was disappointed. It wasn't bad, but it was good. And with only 1 real moment of brilliance, it just doesn't stack up for me. That moment? What I call the "Jane don't leave me scene." Fassbender struck something there that was breathtaking. Its beautiful, its painful, its not really hampered by wordiness, and the emotion is overwhelming. This is the only scene where I think Fassbender and Mia Wasikawska have powerful chemistry. Any chemistry at all, actually. You meet Jane around the same time as St.John at the beginning of the film, and Jamie Bell is brilliant. Actually, I will openly argue with anyone that he's the standout performance of this adaption. Meeting him when we do, seeing him with his sisters, before we meet Rochester and without Jane's colored perspective, we see a St.John who is kind and sweet, and a very normal young man. He is neither overly cold, nor is he austere; he is simply a man. It is refreshing to think of him finally in a different way. While St.John is a fully fleshed character for the first time, characters such as Grace Pool and Bertha, yes even Bertha, are practically non-existent. Others like Mason and Helen are quick plot devices in relation. And Jane? Well Wasikawska isn't Ruth Wilson. I'm sorry, she was better than most Janes, but without any of her own conviction, or any chemistry with Rochester, what else can I say? She shines, as do all the characters, in the scenes with the Rivers. There she has chemistry, there she has unreserved conviction, there we have a little but more life in our character. And then, there's the fan service moment. What is fan service? Its normally in fanfiction and its a moment created JUST for fans to make them scream or giggle or forgive all injustices anywhere else in a story.This Jane Eyre has one. Fukunaga doesn't even try to hide it. Its just there. More like, BAM, o! hi! If you've seen the movie, you know the moment I'm talking about. If you haven't I'll set the scene: snow. door. Rochester. Kiss. YOU WISH THIS WAS REAL. Yep. 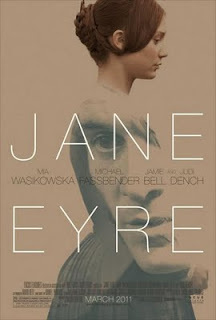 A total fan service moment meant to make us Jane Eyre fans forget all the things we weren't sure of in this adaptation. While I applaud the effort, a little more finesse would have been nice. Even my mom knew exactly what I meant when I whispered "fan service?!" to her in the theater. Overall, what does this reviewer think? Well, I think I think what I always was nervous about happened: the new, shiny, 2011 version is just an okay Jane Eyre adaptation. My hopes weren't particularly high; how could they be after Toby Stephens and Ruth Wilson basically changed how the game is played? I'm still very glad I saw it. And I will still buy when it comes out. And will I still post pictures from it? Heck yes. But I am most glad I only had to spend $7.50 plus gas instead of +$60 to see it.